Using an airless paint sprayer for large projects is a must. The effectiveness of the airless paint sprayer over traditional brush and roller are enormous where application areas are large and extensive. For smaller projects, they are not recommended, since the prep time and cleaning time can overwhelm the benefits acquired while applying. So long as you can manage to get the paint job done quickly, there should be no problem. There are many advantages to using the airless paint sprayer over other methods. 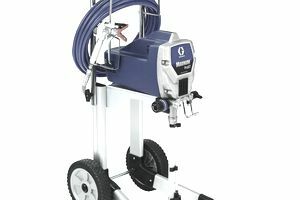 If you are considering using the airless paint sprayer on large projects, go ahead and use it. The multiple functions that the sprayer can give you are extensive. The use of regular roller can leave streaks on your surface area if not applied properly. The airless paint sprayer is better than both traditional methods, meaning that you can get the job done much more quickly than you would expect. The uniform application that the sprayer can produce is ideal on textured walls, popcorn-effect ceilings, or uneven surfaces. Even layers will be applied when the airless paint sprayer is properly handled. Remember to check the remaining amount of paint, because it can leave areas with non-uniform layers. The airless sprayer uses a hose method to push the paint through the nozzle instead of compression. This prevents the overspray problem, which mainly paint machines have, and you can also control the flow of the spray, so it does not go everywhere. Airless paint sprayers can be moved through entire areas, and some of them are placed on a cart for ease of moving. Their motor is usually less than 1 horsepower, so you will not be handling large motors making it easier to move around quickly. A study put together by the Painting and Decorating Contractors of America (PACE) demonstrates that this method can save between 50% and 75% of painting time, so the system can be 4 times faster than brush applications and 2 times faster than roller applications. Most airless paint sprayers have interchangeable tips. Manufacturers have developed an easy numbering system that’s easy to decipher: The first digit refers to half the width of the spray, or fan, from 12 inches away, and the rest of the number denotes the size of the opening in thousandths of an inch. When using an airless paint sprayer, you must also know where to start painting. It is recommended to begin with the edges of the walls at the top corners and move your sprayer toward the middle of the room on your trigger-off motion. If you mishandle the sprayer and too much paint is applied in one specific area, just spread it and smooth it out using a regular paintbrush. Finish all areas next to windows, where other colors adjoin, or corners, then go back and apply paint to large surfaces. Remember to clean thoroughly the machine after you have completed the paint job for the day. Spray the gun or point the gut straight at the surface. Tilting the gun at an angle causes an uneven finish. Make sure you are using the right hose length. Make sure to have the proper pressure applied to avoid overspray and that will also extend the life of your tip. Do not 'fan' the gun. This will cause an uneven finish. Overlapping should be over 50% of the previous coating. Always start at the outside edges of walls and ceilings to improve efficiency. Point the tip at the corner directly instead of spraying towards the corner. Make sure the airless sprayer is close enough to the surface. 12 inches should be good. To avoid double layers of coating, trigger the gun on each stroke and be moving into and out of each trigger pull.